HP Umpire Greg Gibson ejected Astros Pitching Coach Brent Strom for arguing balls and strikes in the bottom of the 7th inning of the Astros-Rays game. With two out and one on, Astros pitcher Dallas Keuchel walked Rays batter Brandon Guyer, prompting a mound visit from Strom, who was subsequently ejected during this visit. Replays indicate Gibson experienced six callable pitches ruled "ball" prior to Strom's ejection in the bottom of the 7th inning and that all pitches were properly officiated (100% Accuracy), the call was correct. At the time of the ejection, the Rays were leading, 3-0. The Rays ultimately won the contest, 3-0. This is Greg Gibson (53)'s fifth ejection of 2015. Greg Gibson now has 13 points in the UEFL Standings (9 Previous + 2 MLB + 2 Correct Call = 13). Crew Chief Greg Gibson now has 11 points in Crew Division (10 Previous + 1 Correct Call = 11). 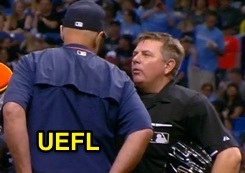 This is the 123rd ejection of the 2015 MLB Regular Season. This is the Astros' 4th ejection of 2015, T-1st in the AL West (HOU, SEA 4; LAA, OAK, TEX 2). This is Brent Strom's first career MLB ejection. This is Greg Gibson's first ejection since April 19, 2015 (Kelvin Herrera; QOC = U [Throwing At]).